This week's BriForum video comes from BriForum 2008 Chicago, where Rick Mack presented a session entitled "My Application Won't Work." From the session description: This session will be a discussion of tools that are available to find out what applications are doing. 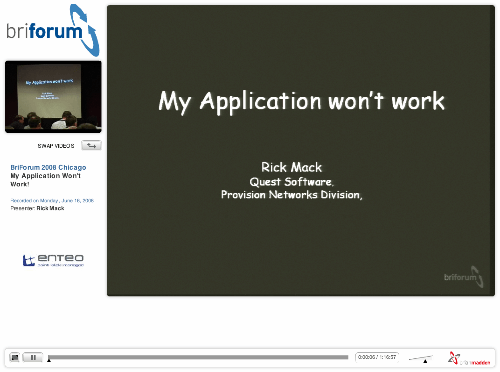 This week's BriForum video comes from BriForum 2008 Chicago, where Rick Mack presented a session entitled "My Application Won't Work." This session will be a discussion of tools that are available to find out what applications are doing. Rick will show some examples on the use of the tools to solve problems running specific applications, either as a non-privileged user or on terminal services. The examples will include AutoCAD 2008. A few words about who this session is for - This session is for IT professionals responsible for successfully deploying applications either on locked-down (user not local admins) VDI VMs and fat clients or on Terminal Services. To download the slide deck, click here. To watch the video, click here or on the image below. This shows some "roll up yer sleeves" application hacking that should be able to teach an old dog some new tricks. I can't download the slide, could u help me?Thanks!